The Orlow Firm represents people who have been injured by the negligence of property owners in Brooklyn slip-and-fall accidents. At our law firm, you will always work with a partner. We believe you should expect that from any personal injury law firm you hire. Call (646) 647-3398 to schedule your free consultation. You can also submit a contact form and we will be in touch with you promptly. How Do Brooklyn Slip-and-Fall Accidents Happen? These accidents can happen at work, in stores, at other people’s homes and many other places. Those who are responsible for your injury should be held accountable. 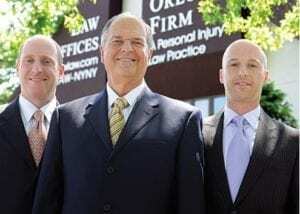 At The Orlow Firm, our Brooklyn attorneys are ready to assist you with your injury claim today. In Brooklyn, property owners, grocery store owners, retail store owners and even large corporations can be held liable for your injuries if negligence was the main cause of your slip-and-fall accident. It is just as unacceptable for a property owner to neglect the repair of cracked walkways and faulty railings on staircases as it is for a store owner to ignore standardized safety procedures by neglecting to place warning signs when the floor is wet or an item recently spilled on the floor. If you or a loved one suffered an injury due to a slip-and-fall accident in Brooklyn, our qualified and experienced lawyers will offer a confidential and honest assessment of your case. Our cases are handled on a contingent basis, which means that we are paid only when we recover money damages.